On Seguin Island, about 2.5 miles from the mouth of the Kennebec River. Grounds and museum are open to the public, and lighthouse tours are provided during the summer months. Seguin Island lighthouse is Maine’s second oldest lighthouse. George Washington gave the order to build the first tower made of wood in 1795, which lasted for about 25 years. At 186 feet above sea level, it is also the highest lighthouse in the state. In 1857, the tower was rebuilt and because of the heavy shipping in the area, a first-order Fresnel lens, the most powerful light, was installed in the lantern. It also had one of the largest foghorns to accommodate the nearly one-third of foggy days each year at the island. The first Keeper was Count John Polersky, born of European nobility, who received the appointment as a reward for military service in the Revolutionary War. Almost as sooon as he arrived he complained about his salery, and the fact there was no food on the island and he would have to bring over two cows at his own expense to support his family. His requests for a salery increase were refused. Five years later, even though he took great pride in his duties in keeping the light shining, the keeper died penniless on the island from failing health due to his constant strife with dampness, and struggle from storms that destoyed his keeper's quarters, gardens, and boats, which needed constant rebuilding and repairs. Most of the time his family stayed on the mainland with friends and relatives. At 186 feet above sea level, it is also the highest lighthouse in the state. In 1857, the tower was rebuilt and because of the heavy shipping in the area, a first-order Fresnel lens, the most powerful light, was installed in the lantern. It also had one of the largest foghorns to accommodate the nearly one-third of foggy days each year at the island. In the early 1900’s, Keeper Herbert Spinney created a “museum” at Seguin of mounted birds, butterflies, and minerals filling most of the wall space at the site. As this brought many tourists to the lighthouse, he began charging a dime admission fee to keep the crowds more manageable. Because of the steep quarter-mile climb up to the lighthouse, a tramway system was installed leading from the boathouse to the keeper's house. After a near tragic accident occurred on the tramway involving the Keeper’s wife and baby in the mid-1900’s, passengers were not allowed on the tramway. Seguin Island also has a few ghost stories. One concerns a nineteenth century keeper's wife who played the same tune over and over on her piano as it was the only tune that came with the piano, which drove the keeper insane, causing him to destroy the piano with an axe, then killing his wife and himself. Legend has it that the piano tune can still be heard drifting from the island on calm nights. There have also been sightings of a young girl running in the house believed to be the daughter of one of the keepers who had died at the lighthouse. There has been an account of furniture being moved from the beacon and mysteriously the cable was cut, smashing all the contents on the rocks, preemtped by a visit by the "Old Captain," whom many beleive was Count John Polersky. Even recently, responsible caretakers who take over the duties in the lighthouse during the summer months have reported paranormal activities, especially if changes were being made in rearranging furniture etc. In the years 1999-2000, the lighthouse was the subject of debate between preservationists and the Coast Guard, which wanted to extinguish the light and put up a solar-powered skeletal tower. In March 2000, under pressure from Congress and the public, the Guard dropped its plans to deactivate the light. The first order lens is still at the lighthouse and was restored in 2007, making it the only lighthouse in Maine with a first order lens still at the site. Caretakers who are chosen to tend the light, can receive tourists during the summer season while occupying the keeper’s house. Bath is Maine’s largest ship building city and was one of the Maine’s premiere shipping ports. Bath promotes its historic year-round waterfront downtown set along the banks of the Kennebec River amid 19th century buildings, artist galleries, and specialty shops. The Maine Maritime Museum offers lighthouses tours and preserves many of Maine’s maritime artifacts and archives since 1607. 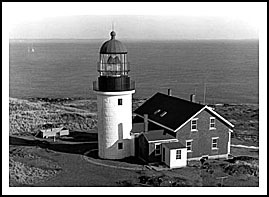 They are in the process of and will have completed for June 2017, a first of its kind exhibition of being in the lantern room as a full scale replica of Cape Elizabeth light with a second order lens. The room will have a time-lapsed video projection displaying a panorama of the Gulf of Maine that changes with the weather and seasons. Seguin Island is open to private boaters, and there are cruises available from Bath, Freeport, Popham Beach, and Boothbay Harbor. Fort Popham State Historic Site is part of Popham Beach within the state park. During low tide on a clear day visitors can hike up one of the hills from the sea and get a closer view of Seguin Island Light and nearby Pond Island Light. The Fish ‘N Trips boat provides ferry service daily during the summer season to Seguin Island. There are plenty of areas to hike on this small island and enjoy some great views. Wear appropriate clothing as you'll probably have to jump out of the boat and knee high waters and surf. The island is very hilly with lots of room for hiking and exploring. Spend the day! The Virginia was the first English ship built in North America over 400 years ago. An exact replica is being built at Popham. Educational programs on New England’s maritime history are open there as well. Boat cruises and ferries mentioned below may offer many types of cruises. 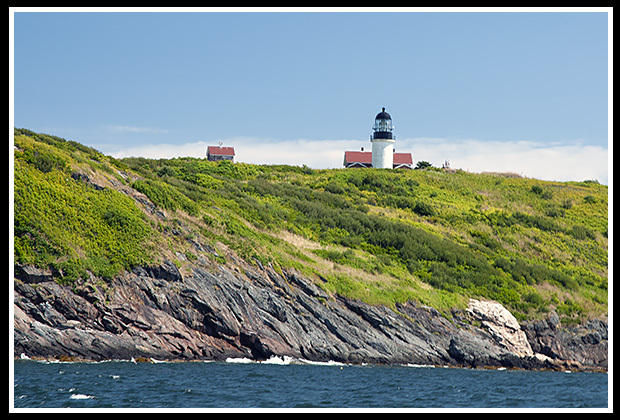 While some may offer specific lighthouse cruises that pass by Sequin Island Lighthouse, they may pass by the lighthouse as part of charters, narrated wildlife and historic tours, ferrying passengers, whale watching, fishing tours, and other types of excursions. Weather is also a major factor in New England, especially on sailing excursions. Provides ferry service to Seguin Island, fishing trips, and special charters. Chartered pontoon boat for lighthouse excursions. Enjoy a relaxed schedule and really get a chance to view the lighthouses and wildlife. 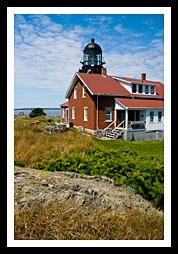 Tours of Boothbay region including lighthouse tours, lobster, and fishing tours. Private charters available. 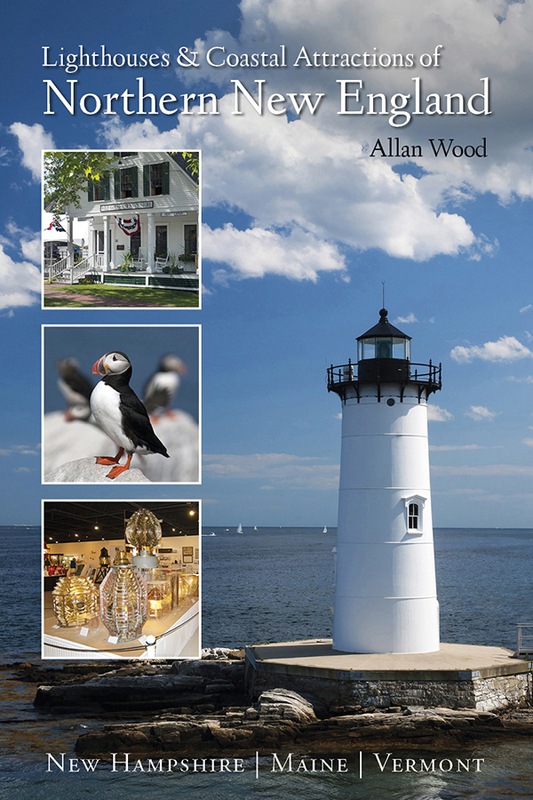 My 300-page book (with over 360 images), Lighthouses and Coastal Attractions of Northern New England: New Hampshire, Maine, and Vermont, provides human interest stories from each of the 76 lighthouses, along with plenty of coastal attractions and tours near each beacon. In the special section showcasing haunted lighthouses, you'll find the stories surrounding Seguin Island lighthouse.